Who could’ve thought that one of Australia’s national treasures, the platypus, could be the key to the global fight against antibiotic resistance? 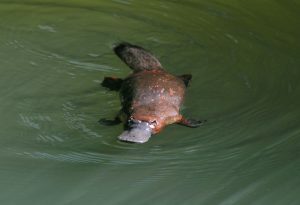 Due to the platypus’ unique features, scientists have been keen to study these aquatic monotremes (egg laying mammals) and back in 2010, Australian scientists found that platypus milk contained potent antibacterial properties. These properties contain a curly protein, which could be used in the fight against the human body’s growing antibiotic resistance. Named after the famous child actor for her curly hair, the so-called “Shirley Temple proteins” found in the milk can kill off superbugs and bacteria that are resistant to antibodies. A team of CSIRO and Deakin University researchers have discovered why platypus milk is filled with these antibiotic resistances that one day, could save lives. Since platypus are monotremes, they produce milk not through teats, but by releasing the fluid through their skin and onto their bellies for their young to drink. By doing this, the milk is exposed to the harsh Australian environment, which can leave a platypus’ young vulnerable to bacteria and dirt. The research team were able to successfully make the protein, in order to then figure out the exact structure, so they could get a better look at it and understand it more. What they were able to find was the unique, never before seen Shirley Temple 3D fold. Scientists say the Shirley Temple’s shape along with what it’s made from, is crucial for the protein’s antibacterial properties. “Although we’ve identified this highly unusual protein as only existing in monotremes, this discovery increases our knowledge of protein structures in general and will go on to inform other drug discovery work done at the Centre,” Dr Newman said. Why look for new treatments? For almost a century, antibiotics have helped to fight bacteria that makes us sick, but in recent decades antibiotics have lost their effectiveness against some types of bacteria. The use of antibiotics has in fact helped to create new resistant strains of bacteria called “superbugs”. These superbugs infect more than 2 million people in the US and kill at least 23,000 each year, according to the U.S Centres for Disease Control and Prevention. Diseases such as tuberculosis, gonorrhoea and staph infections have some drug-resistant and are some of the dangers we now face. Some scientists believe drug-resistant bacteria are being created because many antibiotics prescribed to people and animals are unnecessary, and the drugs are being overused and misused. The term “superbug” doesn’t mean that the bacteria can’t be treated by antibiotics, though – it just means that most commonly used antibiotics are ineffective. How do we access the milk? Even though platypus milk is now believed to be the key in fighting superbugs, milking monotremes is a unique process. Dr Julie Sharp from Deakin University was part of the team that collected the significant sample of platypus milk. She told the ABC procuring the sample involved silently wading through a river in the Gippsland region in Victoria, humanely trapping platypus in an environmentally-friendly trap and then gently motivating milk production. “We inject them with a hormone called oxytocin and that allows the milk let-down and then we scoop it up into little tubes,” Dr Sharp said. Echidnas (which are also monotremes), have the same protein in their milk, as they feed their young in the same way. Dr Sharp said her team’s goal is now to study monotreme milk and to identify and understand more about the antibacterial compounds, to work out if it might be targeting and killing the bacteria in a different way. Have you ever been struck down by a superbug?